The 1950’s was the start of the Bowman and Topps Wars. 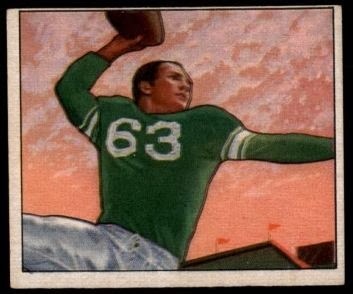 During the 1950’s the number of teams and players would increase, therefore there would be more cards available then in previous sets. 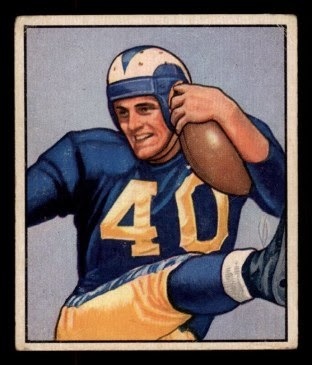 The 1950 Bowman Football Complete Set contains 144 cards. This set is truly a classic and a treasure to have. Collectors like this set because it is quite the challenge to piece on together. There were not that many cards for this series produced. This set also contains no errors or short prints. When this series of cards was first introduced it was sold in nickel wax packs. Only on a real rare occasion can you find a wax pack for this series in today’s time. The photos on these cards have one of four possible positions/poses. The card features either a close up, kicking pose, catching pose or the player running. When you flip the card over you can tell that Bowman still had not changed what the backs of the cards looked like. The back is on a very plain piece of cardboard paper with the players name in red. 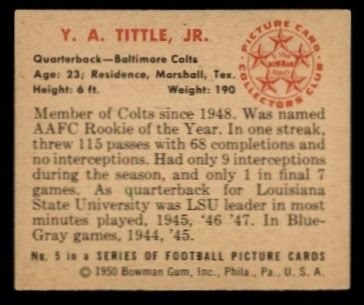 Below that, in black ink is a short bio with the position the player had at the time.